Most people want to know what they’re putting into their bodies before they actually do it. Whether that means reading all the nutrition facts on your favorite snacks or checking to see what’s in your medicine, this sort of research tends to play—though sometimes unconsciously—a role in our everyday lives. Understandably, the same need to know what you’re consuming is true with hemp and cannabis products. Not only because it’s the standard for ALL things consumable, but particularly because of their more controversial nature, this is precisely why hemp and cannabis products go through rigorous lab testing. It’s crucial to better inform consumers about the strength and composition of these substances with the hopes of promoting a more informed consumer. Beyond the regular consumer market, these lab tests are also important for medical patients who require specific effects, such as pain relief, nausea relief, etc. Of course, with all organic substances, these lab tests play an important role since the effects of the product can vary hugely depending on whether the product comes from a THC or a CBD-heavy strain. As with most lab tests, there are plenty of different methods that are used to determine a certain product’s safety, quality, and potency. 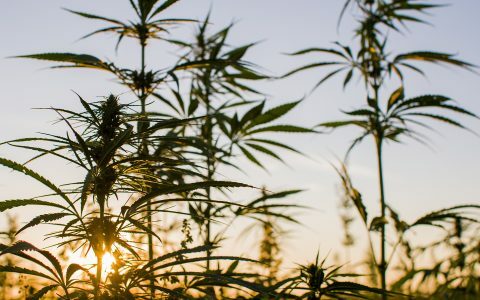 While testing requirements vary by state and there are no strong general guidelines to follow in these tests, a lot of the procedures are pretty common throughout the hemp and cannabis industry. Why test for CBD and THC levels? Measuring CBD and THC levels is crucial in order to be fully informed about what you’re consuming and what it’s going to do to you. You probably know that THC and CBD are very closely related (as with hemp and marijuana), but they aren’t the same, and neither are their effects! They do have a few shared perks, but their other effects are the opposite one to the other, which of course reinforces why these tests are so important. Basically, it breaks down to this: if you’re looking for a psychedelic effect, you’re going to want a product with a high THC:CBD ratio. On the other hand, if you’re looking for pain relief, nausea relief, better sleep, or other effects offered by CBD without the high, you’re going to want a high CBD:THC ratio. How is this testing done? There are many, many ways to test for CBD and THC levels, but like we said, there are a few procedures that are more common than the rest. 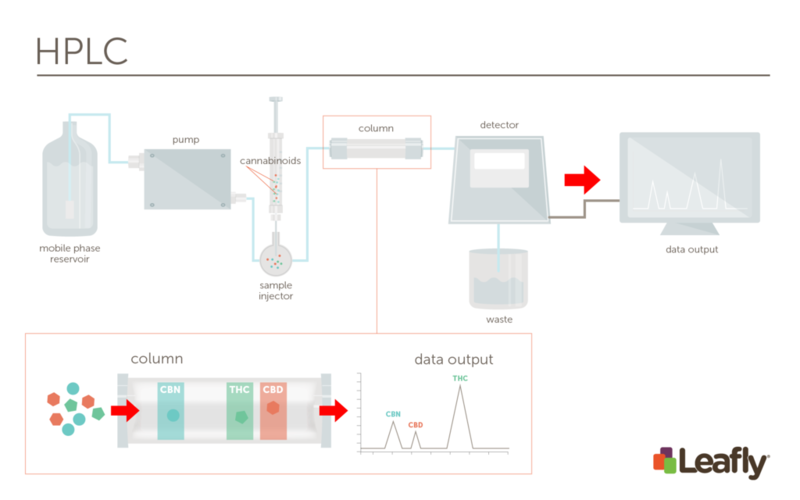 The most common method is the High Performance Liquid Chromatography (HPLC). Basically, HPLC takes a liquid solution and separates its chemicals, measuring its chemical composition. A sample is taken from the product or plant in question and combined with a liquid solvent, usually ethanol. This solution is then pumped through a tube that attracts certain chemicals based on their chemical properties. The chemicals attracted pass through the tube much less quickly, and can then be measured as they pass by. Get a nice visual of that? Still with us? The chemicals traveling through the tube are measured by a special detection device that utilizes ultra violet light. Different chemicals absorb the UV light differently and at different rates. And because CBD and THC are chemically distinct, the UV light travels through them at different speeds. In fact, the easiest part of the test is differentiating between the two chemicals. And that’s how we know how much of each chemical is in a certain product or strain! There are also loads of other tests that can be done, including some you can do at home! The CB Scientific THC Detection Kit is something you can use at home that resembles the PH tests you might remember from your high school biology class. This test consists in placing small amounts of the plant into a vial, then combining it with the kit solutions and shaking the mixture. The solution will then begin to react with the chemicals in the vial and will turn a certain color. The kit comes with a color chart that tells you how much THC corresponds with the resulting shade—if your mixture turned white or very pale red, then there’s no THC. But if the mixture turns dark red, then you’re dealing with a mixture composed of at least 20% THC. These DIY home tests can be taken pretty seriously, too. The CB Scientific Personal Analytics Detection Kit, for example, is a perfectly affordable kit that’s popular everywhere in testing for the two different cannabinoids in a marijuana strain—this kit is even used by the United Nations Office on Drug and Crime! With food, medicine, and even certain beauty products, we can actually be pretty confident about what we read in the product description, nutrition facts, or instructions. There are national organizations that regulate and define the processes that produce this information, after all. A very legitimate worry with CBD and THC products, however, is that these national regulations simply aren’t consistent in this market (yet). Fortunately, the market is such that it’s constructed its own sort of regulations and norms (like with the HPLC test). But be warned that the lack of strong regulations can lead to discrepancies in information and research. Thankfully, states are pushing for standard regulations on a larger scale, as this would allow for more accurate and consistent data and information. This would benefit everyone in the long run. Standards and regulations are necessary, but the fact that they aren’t solidly in place yet shouldn’t discredit the legitimacy of products on the market. That’s what informed consumerism is all about. THC and CBD products still undergo rigorous lab testing to ensure the quality of every product. The processes that these products undergo before they’re released to the market are legitimate and carefully tailored, so be sure to take advantage of this label information when you view products. All in all, THC and CBD products go through laboratory tests to better inform us on what exactly we’re buying, which helps us become better-informed consumers and promotes a well-informed community in general. Flip your next CBD product over, read the label, and remember to write us if you have questions!